An investigation is underway into the cause of a fire at an industrial unit in Peterborough city centre which was gutted by fire in the early hours of this morning. At 1.07am on Wednesday, June 27, emergency services were called to a fire on Cobden Street in Peterborough. 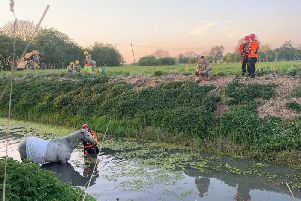 Crews from Dogsthorpe, Stanground, the Peterborough Volunteers Fire Brigade, Yaxley, Whittlesey, and Thorney, along with a water carrier from Ramsey and the incident command unit from Huntingdon, attended the scene. Firefighters arrived to find a well-developed fire in a factory unit, measuring around 50 by 10 metres. Using jets and hose reels they extinguished the fire and returned to their stations by 8am. Eyewitness Eliezer Costa, who took this video of the fire, said the building was used as a commercial laundry, Anglia Laundry Services. An investigation is now underway to determine the cause of the fire.